Fruta Vida Juice is a health, energizing drink that tastes great! Here’s a little more information on some of the amazing ingredients found in this powerful all-natural juice formula. Acai – is a Brazilian Rainforest super berry that has been described on television, such as Oprah, to be one of the most nutritious and powerful foods in the world. This berry is 100% all natural and it is harvested naturally from the depths of the rain forests of Brazil, by the people who have been using it for thousands of years. Acai is packed with Vitamin B1, B2, B3, Vitamin E, Vitamin C, Phosphorus, Calcium, Potassium, Fiber, Proteins, good fatty acids such as Omega 6 and Omega 9. This vitality drink will also treat consumers to energy and a veritable feast of antioxidants, anthocyanins and essential vitamins and nutrients. In fact, studies show that Açai provides significantly more antioxidants than such well-respected foods as blueberries, oranges and even red wine! Perhaps more impressive is the fact that the antioxidant concentration in the Açaí fruit is five times higher than that of Ginkgo biloba, the popular brain boosting herbal supplement that is renowned for its antioxidant properties. Cupuacu – When foreigners visit the rainforest, native Amazonians will often offer them Cupuacu – the taste of the Amazon. But this delicious fruit happens to be a potent health resource, as well. It contains unique antioxidant phytonutrients called polyphenols. You may be familiar with polyphenols from other common medicinal plants, notably green tea and grape seeds. Yerba Mate – South America’s beverage of the Gods. It is widely held that this tea contains mateine, a chemical cousin of caffeine that has subtly different properties. Though similar to caffeine in its ability to provide energy, it can have a milder and safer delivery to the body. Yerba mate is also replete with antioxidants that help the body fight free-radicals. Ultra-filtered water, Brazilian juice blend (apple, acai and cupuacu juice concentrate), yerba mate tea, natural flavor, potassium sorbate (added to maintain freshness), sodium benzoate and malic acid. 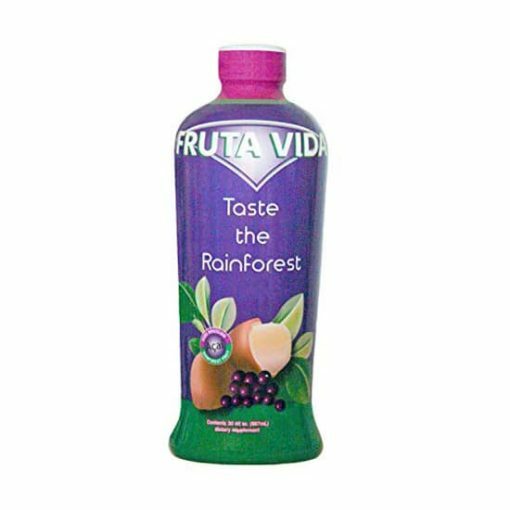 i once upon a time achieved my goal with my weight loss program by using Fruta Vida now I’m back at it again a few years later, what i like about this product is the blend and it taste great only thing is that its pricey, but a small price to pay for the results. Oh yeah! FrutaVida is my #1 energy drink. I drink it each day, especially if I am playing a round or two of golf. FrutaVida helps me stay alert and focused. At age 63 I need all the energy I can get and this drink is just what Doc Price ordered! I am confident that the Acia berry help combat various illnesses. I am rarely ill with common colds or sinus infections while drinking it daily. My wife wonder why I am so active at bedtime..FrutaVida is my secret. It helps in keeping me lean and trim too. During my doctor’s visit a few week ago my doctor said I was in “very good shape for a fellow my age.” Everyone should include FrutaVida in their daily diet especially if they desire to loose a few pounds. I tried this product for the first time, I liked it a lot, I drank an ounce in the morning and another in the afternoon, and found that I had some extra energy and was able to do more than I’m usually motivated to do. I used to get a powdered anti-oxidant elsewhere that cost about the same, but didn’t have much flavor. I liked drinking this juice better, somehow the process of tasting the unique flavors of the juices in the Fruta Vida woke up my taste buds along with the rest of me. I’ll order it next time I need more Gano but not sure if I can afford to keep a regular supply of Fruta Vida on hand. Good stuff ! Christian says * I just want more mommy ! * Later . Simply Delicious ! Heavenly ! Cool . . . .